If, like me, you're a CMF collector, you've probably also appreciated the variants that LEGO have been releasing as boxed GWPs in recent times. 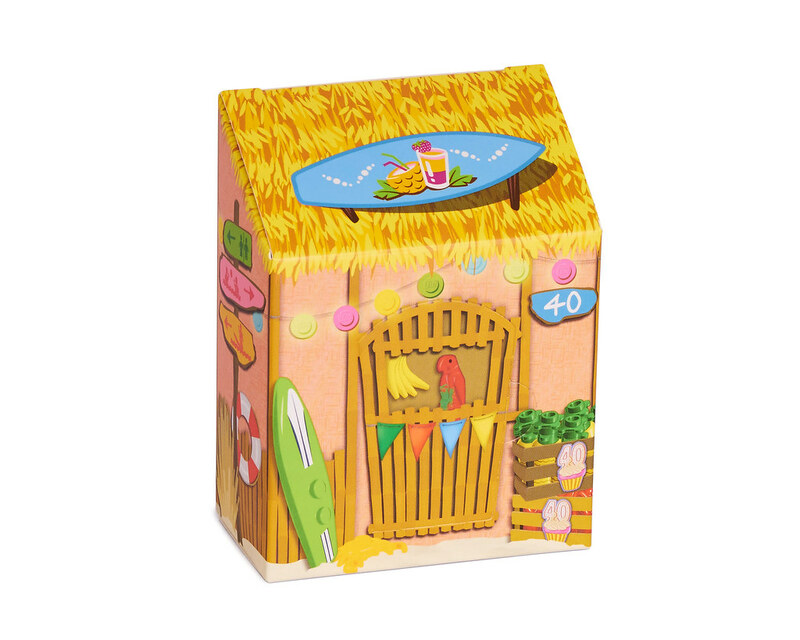 Hot on the heels of 5005249 Easter Bunny Hut comes this, 5005250 Party Banana Juice Bar. 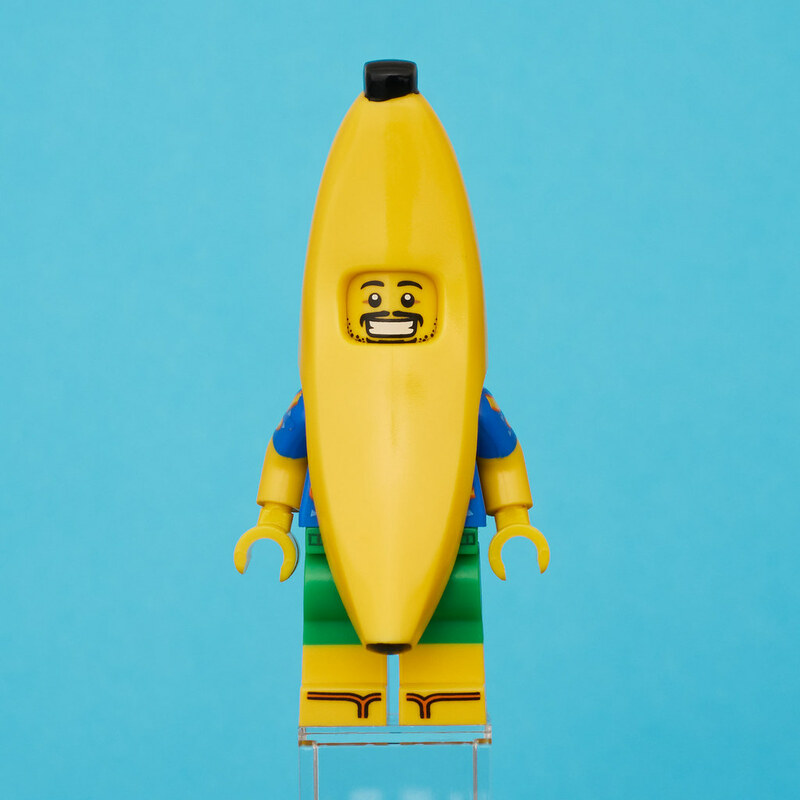 It's a Banana Suit Guy, and as we saw one not that long ago in Series 16, is there a need for another so soon? Is there anything that makes this one special? Slip on ahead for the lowdown. He comes in a small cardboard box with a paper wrapper, the same shape and size as 5005156 Gingerbread Man. Peel off the skin (groan) to reveal what I presume to be a surf shack supposedly serving drinks. It's nicely printed and has a number 40 by the door – is that a nod to the anniversary of the minifigure? The door is perforated so you can open it up and reveal the minifig. 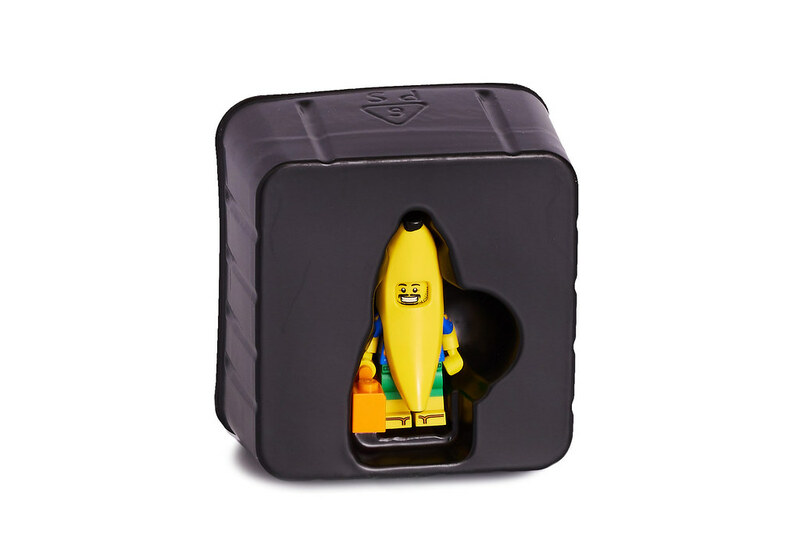 I haven't pictured this open as I didn't want to damage the outer box, but the top lifts up easily and you can slide out the inner tray to reveal the minifigure itself. At a first glance he doesn't look that different – however a little more investigation shows that there's a few reasons why he's quite desirable in my opinion. In the plastic tray you can see he has a funky orange accessory in his hand. This is a boom box, and I believe is it's first outing in this colour. Let's take him out of the tray. 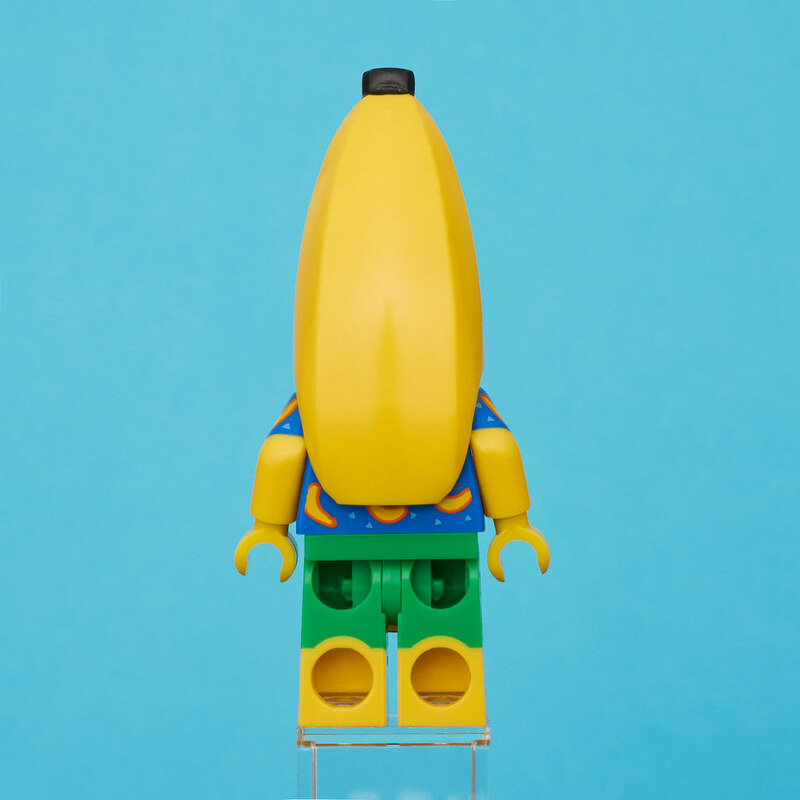 Looking at the front, his banana suit is plain. The Series 16 version has a blue “Banana” print on it so that's the first obvious difference. From the back, you get a hint of what lies beneath. Take off his costume and well, whoahhh. The legs are dual moulded and have prints for sandals and a cord to keep his shorts up. The torso is printed with a superb banana pattern – brilliant for any beach party. In fact it's a real shame to have it hidden under the banana suit at all. I think most people will want to show it off. It's the torso that makes this figure stand out. The head with cheesy grin works perfectly here. I rummaged around to find a suitable wig and came up with this – and I think this is how he will stay in my collection for now. 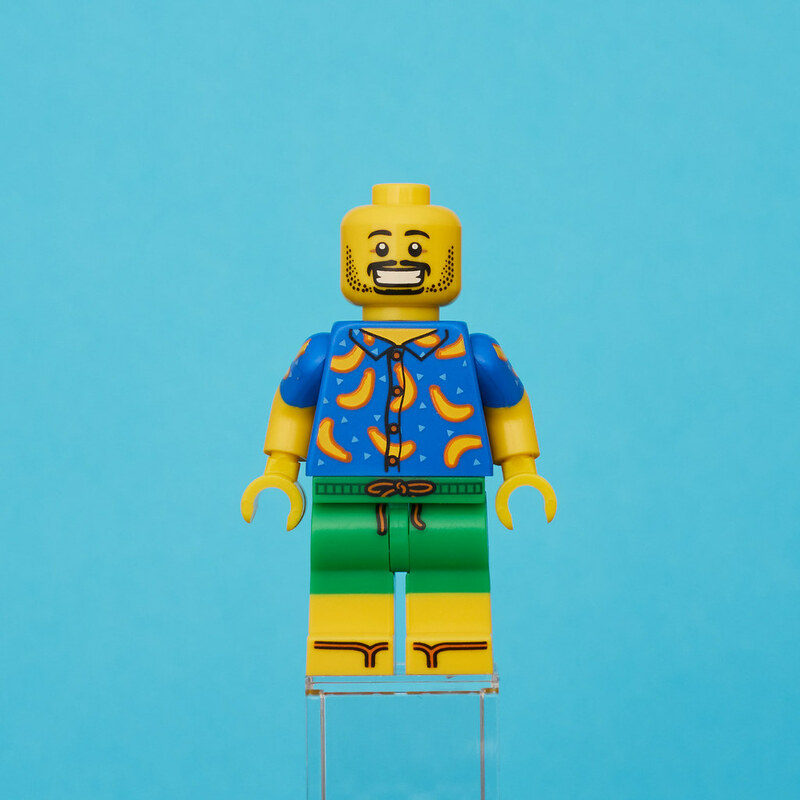 Is he my new favourite minifig? He just might be. So how can you get him? Well at the moment, not very easily. I got mine at Legoland Billund – apparently a park exclusive to celebrate their 50th Anniversary. He's available only when you buy more than 200g at the Pick a Brick bar– roughly a £19 spend. (This was easy for me as they had a load of Sand Green elements). I wonder if he'll start turning up at other parks too? I hope so, as it would be a shame if he wasn't widely available. If anyone discovers him elsewhere then please let us know in the comments along with what you think of the figure. Let's cross our fingers that he makes it to Brand Stores and online as a GWP. I'm actually really annoyed by this set. Not just the fact TRU corrupt capitalism will cause issues in the USA getting the set, but also the fact it's better than the original. This is what the CMF series one should have looked like. 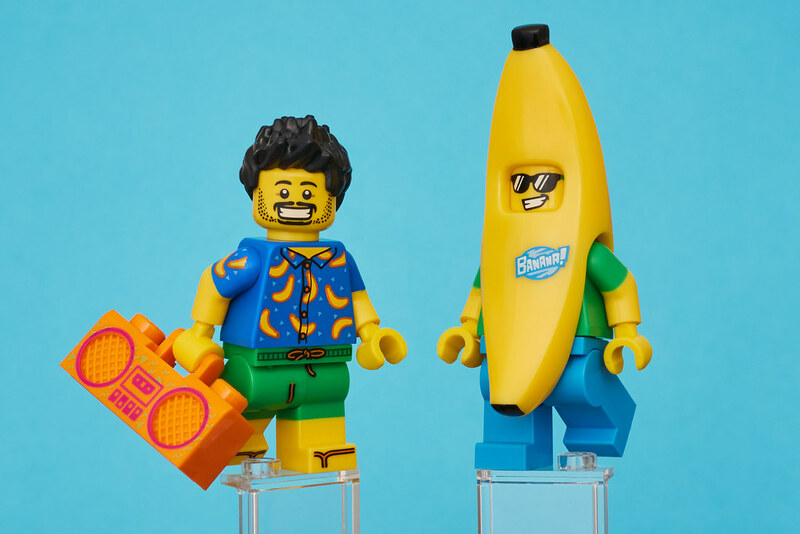 A freebie gets an awesome face print, an awesome printed torso, a plain banana, AND a neat bathing suit? Yet the overpriced $4 figure is just bleh. ^ It was there but it had an unwanted space in the name, all fixed now. 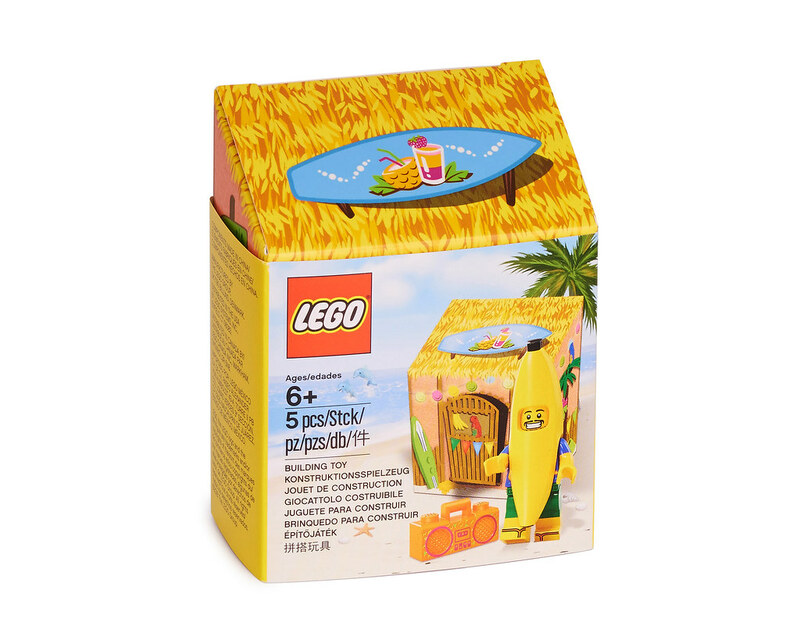 Also does anyone have ideas on how to make a decent minifigure sized banana daiquiri? Banana Party Man really needs a drink! Want to obtain for my CMF collection!! Make it available!!!!! 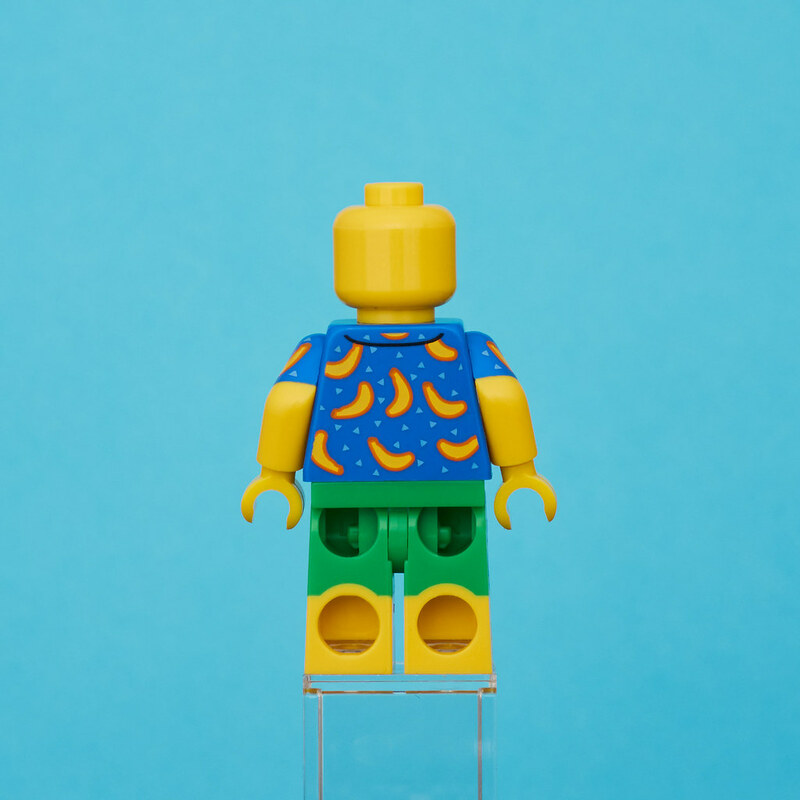 I agree, this minifigure should have been the CMF one! i think they should stop making better versions of the CMF ones in these type of exclusives. they shouldn't even duplicate it. Hot Dog Guy has now been duplicated 3 or 4 times, and Banana Guy, 2 or 3. My son snagged one of these at the minifig trading kiosk at Legoland Florida last weekend. I subsequently added it to MY collection. I didn't know what it was at first as we didn't visit any of the shops while we were at the park that day. It is much better than the original CMF version. the bathing suit and flip flops are a great detail. That's impossible. Perhaps the archives are incomplete. While I like leg prints, this one shows perfectly well why things like drawstring prints do not work on minifigures. Any pose except for standing straight up and the string here becomes broken. If they had left it at a knot n the hips, there would not have been a problem with broken print. This is perfection right there. Might just be my favorite Lego set, period. Yes, I think you might say I'm going bananas over this guy. Sainsbury's had the easter bunny for £4 each or free with £20. Hopefully we'll get it with this. Dual molded legs in a polybag? And we don't get them in star wars? Summer wave, surely! I was over in Billund last week and picked up a couple..
Didn’t really want 200g of pick a brick but we let the son off the lead and get what ever he wanted in the pick a brick, I still haven’t seen what he picked..
Got to the tills and they have to be separate transactions for more than one, I was watching as the guy serving my son said no more of the banana guy, how about a Easter Bunny instead.. I don’t think I have ever moved so fast to say no thanks! It’s Banana guy or a refund. They then went off and found a whole box of them.. 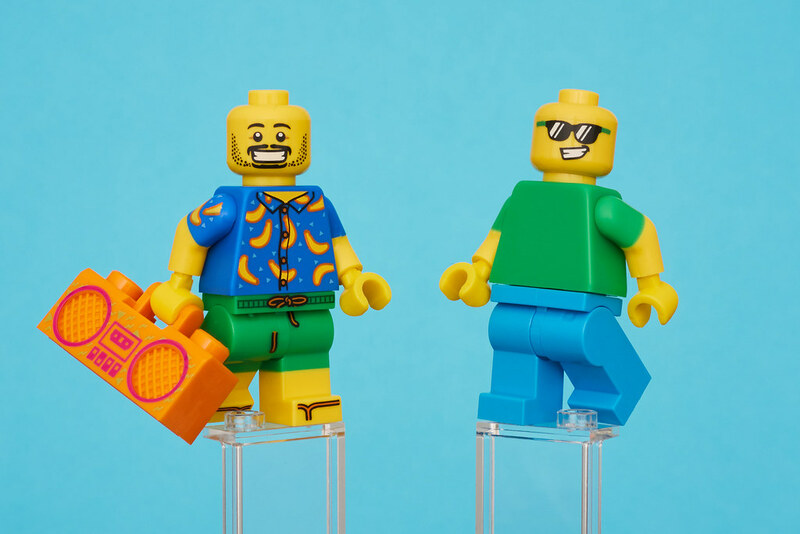 I must admit I was quite pleased when i saw the pic, as I thought another thing I don't want from Lego.com for spending £50 I can save my purchases for something good. But I have to say he is quite cool... but £4 is about my limit if its available somewhere unless its a combined deal at Lego.com. He looks like Luis from Ant-man in non-fleshy. @LukeSkywalker, There's a certain irony in LEGO using *print* on the CMF banana suit guy to represent *a sticker*! I also wanted a banana suit without the label and wound up removing it using Brasso. You can see the result here: http://www.brickshelf.com/gallery/AmperZand/Fantasy/s16_cmf_mocs_2.jpg . 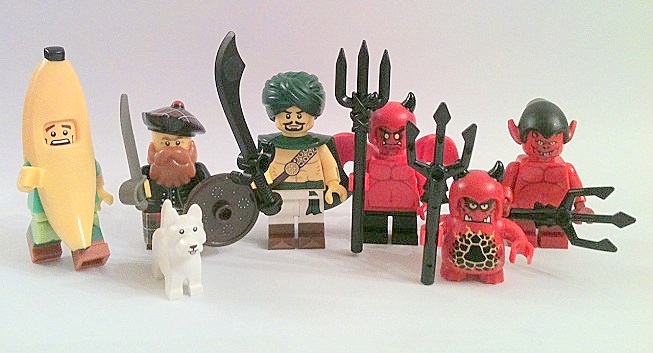 Am I the only one that wants more of these figures from thr CMF to be I tegrated on regular sets? I like those printed hawaianas on his feet. Nice figure, shame about the rarity. But it's what I have come to expect from TLG, so no surprises there unfortunately. He reminds me of Bob Marley. Did Lego release the Jamaican Batman suit from TLBM? The hair and hat from that would look awesome on this guy. If only this had been available instead of that weird Easter bunny one. The Hot Dog costume has been reused many times. So, I don't see why you're annoyed. I bet they’ve made hundreds of thousands of these and they’re making it hard to get hold of early on, then it will be available worldwide when the next wave of sets are released. @Brickchap the 'Reggae Man' suit is in the 70923 Bat-Space-Shuttle. The Red/Yellow/Green suit actually has an 'R' on it, which might be for 'Reggae', but it's based on Robin's shirt with the collar undone. Under the hat and hair you can make out a gold version of the Batman mask, so it's not entirely clear who it's for. 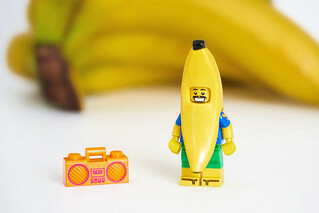 Much better than the CMF Banana Suit Guy! I also love his detailed shirt printing! Looking forward to the sausage party.